To the surprise of pretty much nobody, the "backdoor pilot" for a team of Nazi-hunting Avengers in 1959 that was woven into recent issues of Brian Michael Bendis' New Avengers has worked, resulting in a spinoff series of their own. Avengers: 1959 #1 will arrive in stores this October, with Howard Chaykin resuming his art duties and also taking up the scripting chores as well. Here's how he describes the project. 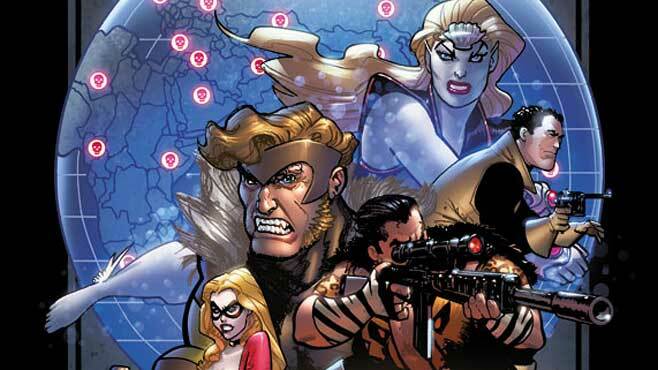 Of course, Nick Fury's team isn't your typical Avengers line-up, as it not only features a bloodthirsty, unrepentant murderer in Victor Creed, aka Sabretooth, but it also features Spider-Man's old nemesis Sergei Kravinoff, aka Kraven the Hunter, who has something going with Namora of Atlantis. It looks as though Dominic Fortune will be sticking around, but there's no sign of the original Silver Sable or Ulysses Bloodstone yet. In their stead, it looks like we're seeing the addition of The Blonde Phantom, whom you may remember seeing in Marvel's recent 70th Anniversary "Timely Comics" event. Here's the preview cover of Avengers: 1959 #1.